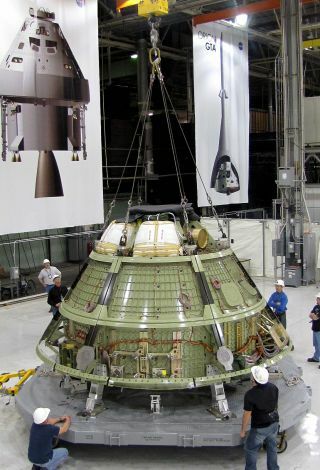 Lockheed Martin engineers at NASA's Michoud Assembly Facility in New Orleans, La., inspect the Orion space capsule ground test structure prior to shipping on Feb. 10, 2011. The crew-carrying spacecraft prototype will undergo rigorous testing to verify it can withstand the harsh environments of a deep space mission. WASHINGTON — Members of the U.S. Senate Commerce, Science and Transportation Committee questioned NASA’s commitment to building new hardware capable of sending astronauts beyond low Earth orbit by mid-decade as directed in a hotly contested but ultimately bipartisan law the panel drafted last year. During a March 15 hearing, the committee’s top Republican, Sen. Kay Bailey Hutchison of Texas, criticized the 2012 budget plan President Barack Obama sent lawmakers Feb. 14, saying it ignores congressional direction in the NASA Authorization Act of 2010 that pared back the administration’s commercial space transportation and technology efforts in favor of rapidly developing a national launch capability needed for manned space missions. Hutchison took particular issue with NASA’s failure to complete a report outlining plans for the capsule and heavy-lift rocket called for in the law and blasted the president’s spending plan for funding the launch system and crew capsule at $1.3 billion below authorized levels. "Once again the request appears to ignore many of the priorities the law has established for human spaceflight," she said. Sen. Bill Nelson, the Florida Democrat who led the drafting of the authorization act, agreed. Nelson had no luck getting NASA officials to pin down the date by which the agency could begin testing Orion atop the core elements of the congressionally mandated rocket. "I want to know how soon you can get testing the initial heavy-lift capability with the proposed funding levels," Nelson told Doug Cooke, NASA associate administrator for exploration systems. Cooke demurred, citing ongoing studies, but said the agency “is trying to get test flights as early as 2016,” the year the law says the initial capability must be operational. Cooke also said the president’s latest budget request, which increases spending for commercial crew transportation and space technology research, reflects the administration’s agenda. "This is a matter of balance and priorities and it’s a NASA priority to develop commercial crew transportation to and from Earth orbit. So it's a question in policy, I believe, of where you draw that balance." NASA said March 14 it has signed a $753 million agreement with the Russian Federal Space Agency, Roscosmos, to continue providing Soyuz vehicles for crew transport and related services to the international space station through June 2016, when the agency expects private U.S. firms to provide a domestic alternative. In a statement, NASA Administrator Charles Bolden, cited the Soyuz contract extension as a reminder of his agency’s commitment to commercial crew initiative following retirement of the space shuttle fleet this year. "The president’s 2012 budget request boosts funding for our partnership with the commercial space industry and prioritizes our efforts to ensure that American astronauts and the cargo they need are transported by American companies rather than continuing to outsource this work to foreign governments," Bolden said. Bill Gerstenmaier, NASA associate administrator for space operations, said the agency’s plan to fly an extra shuttle mission this year would ensure the space station remains adequately equipped through 2012, when two private space firms — Dulles, Va.-based Orbital Sciences Corp. and Hawthorne, Calif.-based Space Exploration Technologies (SpaceX) — are expected to begin regular resupply runs. However, with Congress unable to pass a 2011 budget, NASA and other federal agencies have been operating since last October under a series of continuing resolutions that cap spending at last year’s levels. The most recent stopgap spending bill, a three-week measure approved March 15 in the House of Representatives, would trim agency spending by $63 million. House Republican leaders have proposed cutting NASA’s budget more than $600 million this year. During the hearing, Gerstenmaier warned such a cut could complicate the agency’s plan to fly STS-135, the additional space shuttle mission directed in the authorization act. Gerstenmaier also cautioned lawmakers that the nature of spaceflight makes it likely Orbital and SpaceX will experience at least some small technical hiccups when their competing re-supply vehicles begin flying. "We need some margin" to deal with those, he said.